Nimble Makes it Easy and Fun to Prospect Better, Smarter, Faster. Spend more time engaging your customers and less time logging CRM data. 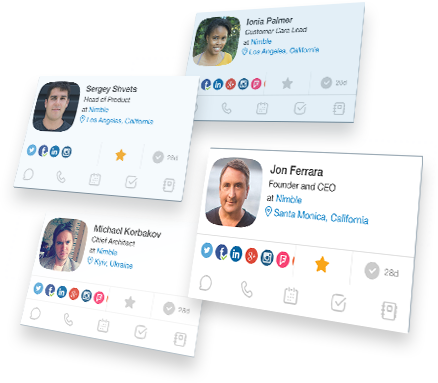 Nimble automatically syncs your team's Google Apps or Office 365 contacts, calendars, email and social interactions to give you the most accurate and current information. Nimble makes it easy to manage your tasks and calendar events. Relate events and tasks to contact and companies or delegate to other team members to know when they've followed up with a critical customer.